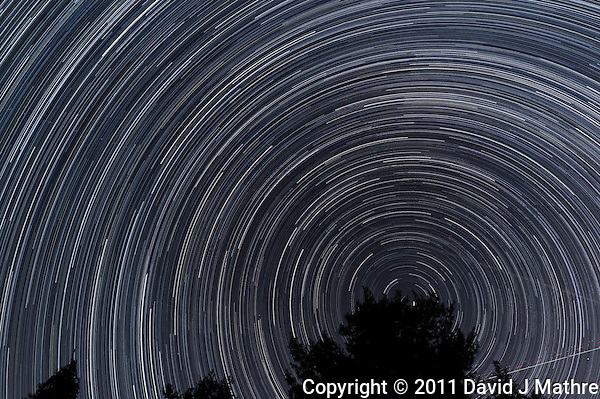 Star Trails and Lens Distortion. One problem I had with the star trail image I just published was that the circles looking toward the north star were not exactly round. This is probably due to the non-linear distortions characteristics of wide-angle lenses, especially toward the edges. There is a program, DxO Optics Pro that corrects for distortion of various cameras and lenses. (Note that the current version of Adobe Camera Raw also does lens corrections for some camera/lens pairs, but not for the Nikon D3s camera and 24 mm f/1.4G lens used for this image). I used the DxO Optics program to process and correct the 328 images. It took over 12 hours for DxO to process all of these images.I then ran the reprocessed images with startrails.exe program. Let me know (comment, or send me an e-mail) if you think the resultant image looks better, no different, or worse. North View Star Trails. Summer Night in New Jersey. Images taken with a Nikon D3s and 24 mm f/1.4G lens (ISO 400, 24 mm, f/4, 1/30 sec). Raw image processed including Nikon 24 mm f/1.4G Lens Correction with DxO Pro. Composite of 328 images combined with StarTrails Program.